University of Michigan-Ann Arbor received a A+. U.S. News & World Report's ranking of 4 out of 117 of National Universities Top Public Rankings was a major contributor to this grade. Long regarded as one of the so-called "Public Ivies," Michigan offers everything from the Residential College, a human-scaled liberal arts experience within the context of a major research university, to the "Big House," a football stadium that holds more than 100,000 fans on any given fall Saturday. Ann Arbor is where Presidential candidate John F. Kennedy stood and made the remarks that led to the creation of the Peace Corps, and you can find the plaque on your tour. The focus of a Supreme Court case regarding the use of race in admissions, Michigan is a flagship institution with high name recognition. Describe the type of student who should attend University of Michigan-Ann Arbor. Why? How does the University of Michigan regard IB ( International Baccalaureate) in terms of admission? What is a typical University of Michigan-Ann Arbor student like? Describe the type of person that should attend University of Michigan-Ann Arbor. What are the top 3 reasons someone should attend University of Michigan-Ann Arbor? What was a typical University of Michigan-Ann Arbor student like in high school? Describe the type of person that should attend University of Michigan-Ann Arbor. A high school student who is known for doing too much, and then some, as well as for being committed to bettering the world in which they live is University of Michigan - Ann Arbor material. Superb honors and living/learning programs are the best bet for highly motivated students. One of the favorite student hangouts on campus, especially on warmer days, is the Diag. The volume of applications means the admissions office must rely heavily on numbers to make its decision. Excellent academics and contagious school pride. As the University of Michigan prepares to embark on its third century, we fully embrace the legacy bestowed upon us by President James B. Angell in our first century. We are proud to offer "an uncommon education for the common man." We draw from study and experience to prepare our students for leadership in a wide range of social endeavors, including government, law, education, medicine and business, reflecting the University's many roles in contributing to good design and decision making within major domestic and international institutions. What are the top 3 things that students do for fun at University of Michigan-Ann Arbor? Students at the University of Michigan attend sporting events such as football games, join clubs and organizations, and spend time with friends for fun. The average student pays $15,939 for tuition, fees, and other expenses, after grants and scholarships. Total stated tuition is $12,948, in-state and on-campus, before financial aid. 47% of students receive some form of financial aid. Learn more about financial aid at http://www.finaid.umich.edu. Estimate the net price for you at http://www.finaid.umich.edu/topnav/resources/mcalc.aspx. 89% of students graduated in six years. The typical (median) early career salary of University of Michigan-Ann Arbor graduates is $54,000, according to Payscale. University of Michigan-Ann Arbor participates in the NCAA Division I-A for college athletics. 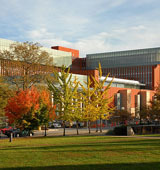 Want more info about University of Michigan-Ann Arbor? Get free advice from education experts and Noodle community members. What are 5 adjectives that describe a typical student at UMich? What are the most popular extracurricular activities at Umich? Greek life and intramural sports are popular on my college campus, especially for those who live on the Central and South campuses. What do you like about UMich's campus and culture? If you were student body president of UMich, what would you change? I would most likely put some sort of restraint on Greek Life, as there have recently been several arising issues amongst those communities and their interactions with the rest of the University and outside locations. Are international students provided financial aid? What was your experience at University Of Michigan-ann Arbor? To me, Michigan was the ultimate college experience. I really couldn't have asked for anything more. What's the city of Ann Arbor like?